Floppy disks recently ran their course and died after a long reign. First developed by IBM in the late 1960s as a microprogram loader and sold commercially by Memorex and then a host of other vendors starting in 1972, floppy drives evolved from 8-inch, to 5.25-inch, to 3.5 inch; from single- to double-sided; and from single-, to double-, to quad-density. But floppy capacities topped out at about 1.44 Mbytes (although there were some fringe formats that had higher capacity), which is woefully inadequate these days. After a gallant attempt by Zip disks to assume the storage mantle from floppies, solid-state thumb drives finally replaced floppies for small, portable media. However, before floppy disks made it big in microcomputers, there was tape. Big reel-to-reel tape drives were used as backup and offline storage for UNIVAC mainframes in the 1950s and tape storage then evolved over many more decades. I’ve owned several tape-backup systems over the years. Even in the early 2000s, you could find a wide variety of QIC (quarter-inch-cartridge) tape cartridges on the shelves at the local Micro Center (a retail chain out of Ohio) here in Santa Clara, California. A couple of years ago, the store blew out all of its remaining in-stock tape cartridges representing several dozen QIC formats. Now they’re all gone. The shelves are now filled with recordable CDs and DVDs instead of tapes. 3M introduced the first QIC tape cartridge, called the DC300, in 1972 (coincident with the first commercially available 8-inch floppy disk drive). The DC300 tape was physically huge (about 6 inches by 4 inches) and held only 200 kbytes on 300 feet of tape. 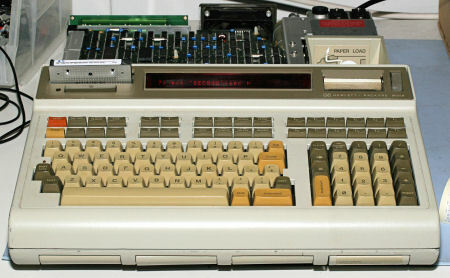 Neither the DC300 tape drive nor the 8-inch floppy drive was physically small enough to fit into Hewlett-Packard’s desktop computers. So HP started a project with 3M to develop a miniature version of the DC300. The new, smaller cartridge was called the DC100 and the first HP machine to use it was the HP 9815A desktop calculator. The drive developed for the cartridge was called the FACT (fast access cartridge transport) drive. The HP 9815A was quickly followed by the HP 9825A desktop calculator, which I worked on back in the mid 1970s. HP’s handheld calculator division later introduced the HP 85 desktop computer that also used DC100 tapes. I have four HP 9825A and HP 9825B machines (thanks to eBay). They’re all still operable except for the DC100 tape drive, which has a well-known mechanical failure mechanism. All QIC tape drives use a rubber capstan to move the tape in the cartridge. Without fail, the rubber on this capstan turns to goo over 20-30 years and the capstan is no longer able to move the tape. 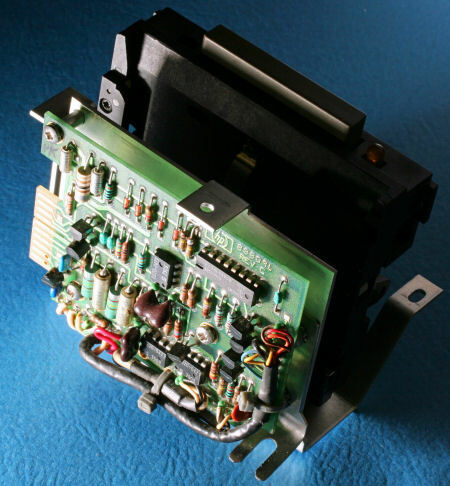 Unsurprisingly, new capstans or replacement drives aren’t to be had for love or money. The hobbyist community has developed a wide variety of homebrew capstan repair procedures involving dipping plastic, rubber tubing, silicone tape, or rubber O-rings. However, the tape cartridges fail as well. After decades of storage, the oxide delaminates from the backing Mylar tape and falls off, usually contaminating the tape head with oxide flakes in the process. So I was really surprised to find a fully refurbished HP 85 for sale on eBay. The machine had been beautifully repainted and, most important, the tape drive had been refurbished. I even knew the person who’d done the refurbishing. His name is Larry Atherton, who recently sold his racing software business (Motion Software) and is refurbishing and selling the occasional HP 85 desktop computer and other HP test gear on eBay. Larry pays a lot of attention to detail and the refurbished boxes he sells look like pristine museum pieces. I wrote to Larry and asked him if he’d refurbish one of my HP 9825B drives so I could have a fully working machine. He agreed, partly I think to support my Web site, www.hp9825.com. I unbolted and sent him the tape drive. About a week later, I got the drive back and four QIC tapes. Larry has researched repair alternatives for the capstain and has his own secret formula for the repair that’s more complicated than the homebrew procedures I’ve read about. In addition, the QIC tapes he sent to me are not DC100 tapes. (DC100 tapes technically aren’t called QIC tapes, they’re minicartridges.) In his meticulous way, Larry has explored various currently available QIC cartridges and found a couple of formulations that work. His refurbishing modifies the original HP cartridge drive so that it will accept these new QIC tapes as well as the old DC100 tapes, if there are any operable ones still around. Ingenious! I popped the refurbished tape drive back into my HP 9825B and powered it up. I heard the familiar yet long-forgotten jet-engine noise as the desktop computer’s fan wound up. (Larry has a fix for that too.) I popped one of Larry’s new QIC cartridges into the tape slot and executed an “ldf 0” (load file 0). The tape went “zzzt” and rewound. It spun forward almost silently for a bit and then stopped. Lo and behold, there was indeed a program loaded into the machine! It’s the first time this HP 9825B computer has been able to read a program in a very long time. These days, hard-disk capacities have left tapes in the dust and backup tape drives are quickly becoming so much dusty history. Tape cartridges, with their relatively diminutive capacities, are no longer useful as backup storage for Personal Computers with disk capacities fast approaching a terabyte. However, there was a time when tapes were invaluable. With Larry Atherton’s considerable skills, I’ve been able to revisit those times. Note: Larry Atherton's company is called Motion Software in Brea, CA. His company's web page is at motionsoftware.com and his email address is on the contact page. Be prepared to spend some $$$ because it's not an automated fix and requires hand work, but not much more than you'd pay a mechanic for a couple of hours work on your car. Postscript: Dr. Norman Pillsbury was an early 9825 user who was recently pulled back into the HP 9825’s orbit by a lawsuit. As a California registered forester, Dr. Pillsbury testified in a woodcutting case. Back in the 1980s, Dr. Pillsbury got a grant to analyze harvesting volumes from tree cuttings. He developed sophisticated programs on the HP 9825 to estimate the volume of usable wood obtained from tree harvesting. Decades later, his efforts as an expert witness prompted him to rediscover his DC100 tapes, to purchase an old HP 9825, and to try to recover the programs and data from those tapes. His story is fascinating. Click here to download his story.